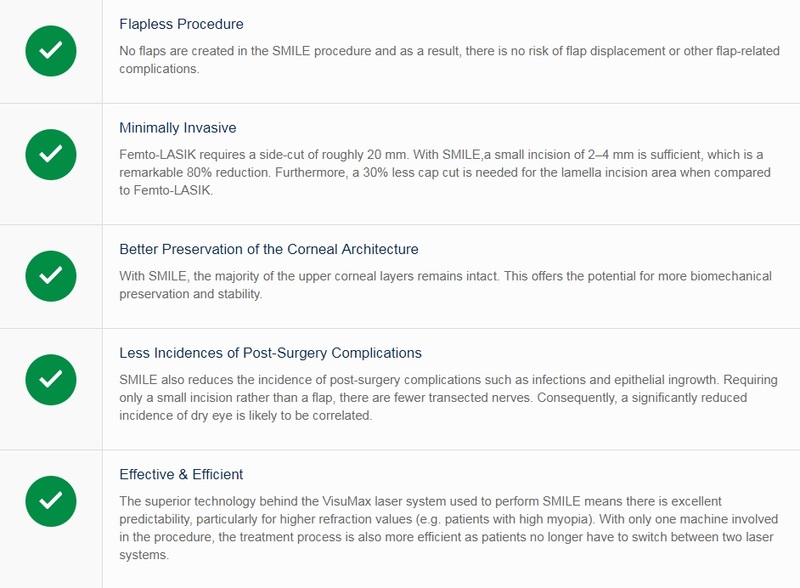 SMILE stands for SMall Incision Lenticule Extraction and is the latest third generation of laser vision correction. 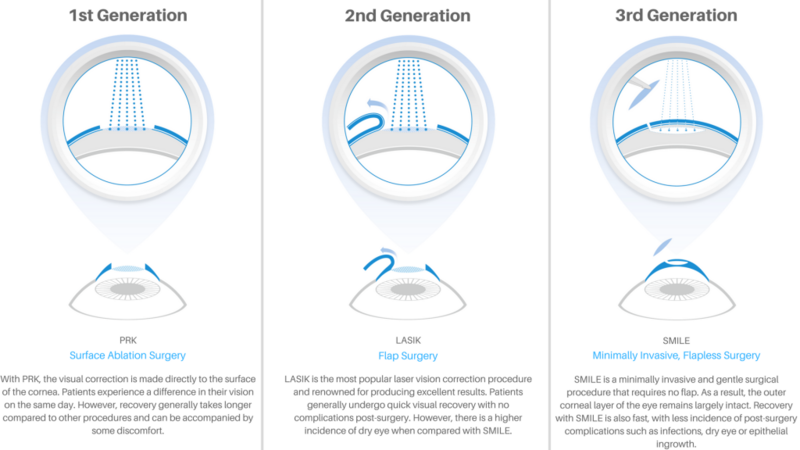 This minimally invasive, flapless procedure corrects myopia (short-sight) and astigmatism with the fastest possible recovery, less side effects and excellent visual outcomes with high predictability compared to previous generations of laser eye surgery. 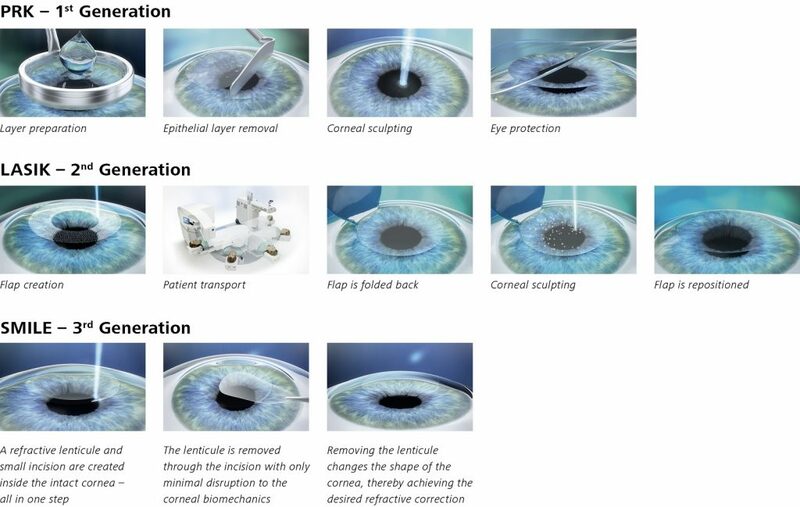 Small incision lenticule extraction, better known as SMILE, is the first minimally invasive Laser Vision Correction procedure. 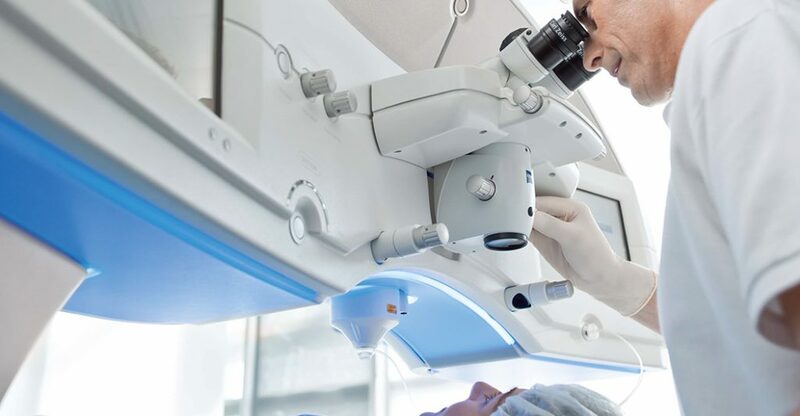 During SMILE eye surgery, a lenticule is created inside the intact cornea using the ZEISS VisuMax femtosecond laser and extracted through a small incision. The lenticule is removed, thereby achieving the desired vision correction. will be taken using a topography scanner. You will be asked to keep your contact lenses out for a short period prior to your consultation (if soft contact lens wearer) or longer for hard / gas permeable lenses as they can warp the shape of the cornea supplying inaccurate measurements. If this occurs, you will be asked to extend the length of time the contact lenses are out and return for more scans and testing on another date. All the information that you require about your surgery day will have been provided at your consultation. SMILE laser eye surgery is performed with Dr Furness at Perth Eye Hospital. Perth Eye Hospital is Perth’s premiere centre for all eye surgical procedures. It is a private hospital based in West Perth. The hospital is fully accredited, complying with the National Safety and Quality Health Standards and is a member of Day Hospitals Australia. Perth Eye Hospital’s exemplary quality-consistency has been confirmed by its prestigious ISO9001 Certification from International Standards Certifications. approximately 3 hours on the day of your procedure. The laser operating suite is precisely controlled for both temperature and humidity so light comfortable clothes are all that will be needed. It is better to have only a light snack and drink well prior to the laser vision procedure. We ask that you do not wear any perfume / aftershave or alcohol based deodorants and women are asked to not wear any make-up ensuring the eye area is thoroughly cleansed. at Perth Eye Hospital upon arrival and begin the admission process prior to being taken to the laser suite for your procedure. The admission process consists of confirming information and going through your post-operative eye drop regime. This is very important as the eye drops assist in ensuring a rapid and comfortable recovery. You will be brought to the patient lounge to rest for a brief period. You will be given some light refreshments and an opportunity to relax. Dr Furness will see you once more to have a final look at your eye(s) and an opportunity to ask any questions that may have arisen prior to heading home. You will be able to contact Dr Furness directly on his mobile for any queries or questions at all times. You should travel straight home. We recommend a friend or family member be available for the first night following surgery for extra assistance with eye drops and support should you require it. Although you have likely reached driving standards within a a few hours, it is not advisable to drive until Dr Furness has cleared you at your day 1 post-operative appointment which will be held in our boutique clinic in Subiaco. To put your mind at ease, you are given Dr Furness’ mobile number for out of office hours for any queries or concerns you may have. You will be provided with an eye drop medication chart at Perth Eye Hospital and your post-operative eye drops. It is important these are taken as recommended as they will minimise healing time and improve comfort in your eyes. We recommend that you wear non-prescription sunglasses when outdoors for the first couple of weeks following surgery as a temporary side effect of your procedure may be light sensitivity. Sunglasses will also help to keep any dust that may be present in the air from getting into your eyes and causing further dryness and / or irritation. You should avoid rubbing your eyes following your procedure. So that you can avoid rubbing your eyes in your sleep, the hospital will provide you with clear plastic eye shields to wear for the first 3 nights after your procedure which act as a barrier to stop you rubbing or touching your eyes. Avoid getting any water in the eyes for the first couple of weeks after your laser eye treatment. It is common for people to squeeze their eyes closed after surgery when eyes are itchy or when bathing. Please avoid squeezing the eyes closed. Itchy eyes are caused by dryness which is the most common side effect following laser eye surgery and a lubricating eye drop can be used to improve comfort. We ask that women do not wear any eye make-up for the first 7 days following their SMILE laser eye procedure. Contact sports should be avoided for up to 4 weeks following your procedure and it is a good idea to disclose to Dr Furness at your consultation what sort of sports and hobbies you take part in so that we can advise you accordingly about your aftercare. It is also recommended you do not swim for 2 weeks. It is a common misconception that it doesn’t matter who the surgeon is as it’s the laser that does all the work. In actual fact, the lasers are responsible for approximately 10% of your visual outcome. It is important to have a surgeon with experience, a wide knowledge base and proven great outcomes. Dr Furness is a cataract and refractive specialist and has performed thousands of successful procedures since qualifying in 1996. Dr Furness is the founder and chief surgeon of Insight Eye Clinic which was established in 1999 and its sister clinic, Laser Sight which is based in Subiaco. Dr Furness’ main aim is visual freedom for his patients. You will be educated to a high degree about the procedure type that is suitable for you and advised accordingly if you are suitable for more than one procedure type as to which is safest and which will provide the best post-operative result. All 3 steps of the process are imperative to an outstanding outcome. 1. Consultation 2. Surgery 3. Aftercare. Rest assured you are entrusting your vision to a world class surgeon.